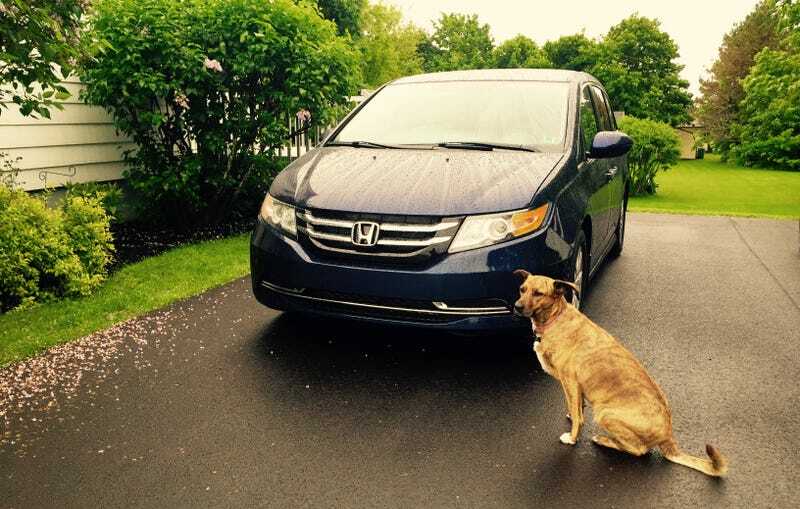 But we chose the 2015 Honda Odyssey. Alas, in our young and growing family, a Miata is not remotely the answer. Sorry kids, an E30 3-Series doesn’t fit the bill, either. The Golf GTI doesn’t offer enough space for humans, stuff, or dogs, which would cause me to shed a tear if I loved the GTI more than I love my people and my dog. But I don’t. A crew cab pickup truck would work well for us, and the fuel efficiency of the current iterations is not off-putting. But after conducting week-long tests of a few crew cab trucks over the last couple years, we determined that a truck, no matter how spacious it is for six, isn’t so great for six plus a dog. Or more than one dog, as is sometimes the case. Full-size SUVs are enormously expensive and don’t typically offer the second-row space you’d expect. So, a minivan it is. Are minivans cool? No. I’d argue that the alternatives do a fairly good job of convincing observers that you’re a parent, too. What, you’ve never seen a Toyota Highlander driven by a mom with spit-up encrusted on her shirt or a dad who pushes a Bob Duallie? It’s not like there are a bunch of young, childless couples living an adventurous off-road lifestyle in a Mazda CX-9. The people you see driving Ford Explorers? They’ve got kids. And I’m of a mind that their parental cool factor is not determined by whether their rear doors are front-hinged or sliding. I am going to tell you what’s great – and what’s not – about the Odyssey. But first, a rundown of the other vehicles that were in contention, in no particular order. Trade-in offers were abysmal, shrinking the price gap to an inconsequential sum. Also, with four siblings driving Grand Caravans, aren’t we allowed to be a little different so that family reunions don’t look like an FCA fleet event? Stow’N’Go is great, and the argument that the stowable seats aren’t comfortable is meaningless to us, since those seats will be filled with child seats. But the rarity with which they’d be stowed caused us to be untroubled by the lack of Stow’N’Go in the Honda. Besides, it’s the third row that we frequently want down, and the mechanism is much slicker in the Honda. Overall, however, it really came down to the price in our personal transaction, including the trade-in, and as soon as the total outlay figures came within striking distance, it was a no-brainer to opt for the significantly superior product. Exclude the trade, and the price gap would have made the DGC appealing. Watch the video. Children severely alter the degree to which vehicle safety is an important factor in a new vehicle decision. The Odyssey aced the same test that the Quest failed. Too small, too loud, only six seats, no space behind the third row. The Odyssey is big, relatively quiet, seats eight, and holds a cottage behind the third row. It’s attractive, but it drives like a land yacht and much of the cabin behind the excellent front row feels like they didn’t think it through, from the way in which the seats move to the squeaks and squawks and rattles. Scarce on both new and pre-owned dealer lots and too pricey when properly equipped. No other three-row crossover entered the conversation because of limited space behind the third row. Scratch that, the 2016 Pilot did enter the conversation even though we haven’t driven it yet. There’s space behind the third row, which makes the Pilot a real contender, but it’s pricier than the Odyssey and not yet readily available, which will actually make the Pilot way pricier than the Odyssey for quite a while. They charge a lot of money for a smaller seven-seater that’s underpowered, won’t save fuel, and is sorely under-equipped. I want one, but not with that engine, those missing features, not at that price. We’ve come close to pulling the Sienna trigger twice before and really enjoyed our time with an AWD Sienna earlier this year. The second-row’s flexibility is terrific. But the less conventional SE in which we’d be interested doesn’t provide the dynamic balance of the Odyssey, and the impressive Driver Easy Speak system doesn’t appear until the price crests $45,000. Bottom line with the improved-for-2015 Sienna: like the Grand Caravan and Sedona, it still drives like a van. Not as much as pre-refresh models, admittedly, but it does still drive like a van. I believe that the Honda Odyssey EX is one of the greatest values, if not the greatest value in 2015’s North American new car arena. It’s not perfect, however. And while many of my critiques may come across as nitpicking, it’s only fair that I point them out. The 6-speed automatic transmission periodically becomes flustered. The A-pillars create a lot of wind noise, made all the worse by a dearth of road and engine noise. The brakes don’t bite as quickly as I’d like. Among minivans, the steering is terrific, but it would need to be quicker for the Odyssey to truly pass itself off as a midsize car. For the price, I’d like to see satellite radio and a power tailgate. HondaLink’s dual-screen layout will never be labelled as intuitive, although I am gradually adapting. The sliding door tracks irritate me, and Honda’s attempt to distract us with a bizarre windowline doesn’t distract – it worsens the only real styling offense of the van. Is the Honda Odyssey the best available family hauler? Not quite. But I couldn’t swing the asking price for a new Mercedes-Benz E63 AMG S 4Matic Wagon.